With BU’s opening game against Union less than a week away, THFB presents its annual captain’s Q&A interview, this year with senior defenseman Brandon Hickey. For the fifth consecutive season, the Terriers are being led by a blueliner. The 6’ 2” Leduc, Alberta, native, has generated 15 goals and 25 assists and has been one of Hockey East’s top shot blockers during his first three seasons. A third-round draft pick of Calgary in 2014, his rights were traded to Arizona last June and he attended Coyotes development camp this past summer along with Clayton Keller and freshman Cam Crotty. Q. Brandon, why did you decide to return for your senior season? What tipped the scales? A. First and foremost, Boston is an amazing city and going to Boston University has been one of the most rewarding and special experiences I’ve had in my life. What kept me here is that I feel we are building something special for this upcoming season. I wanted to be part of it and wanted to help lead the way. It’s hard to want to leave a place like this. Q. How has playing for David Quinn made you a better defenseman? What's the most important thing he’s instilled in you? A. 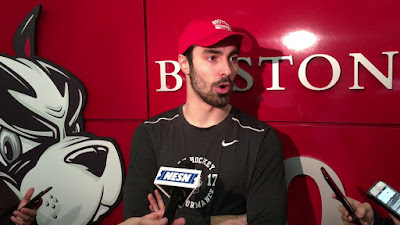 He truly is one of the best defensive minds in hockey today; to be honest, he is the biggest reason why I came to BU. He is unbelievable at picking apart all the little details of your game, everything from stick positioning, to body positioning, all the way to the little things in your posture that could be improved to help you defend more efficiently. The most important thing that he has taught me though is how to approach each day like a pro, whether it is a game, practice, or even a lift. He has always stressed coming into each day with a pro mentality. Q. What are your personal goals for the season and what facets of the game are you looking to improve? A. This season for me is an important one because it is the last chance I have to leave an impression before I turn pro. With that being said, I am looking to continue improving the offensive side of my game, like puck skills, poise with the puck and playmaking. I want to do all of this without sacrificing anything on the defensive side of the puck. That is where there is a fine line. However, my main goal this year is to help instill the BU hockey mentality and culture in the younger players, to show them what they need to do to win this year and in the future. ► Results of the Hockey East Writers and Broadcasters Association pre-season poll are out and BU, with just over half (13) of the 25 possible first-place votes, finished on top for the second consecutive year. A pair of Terrier sophomores, Jake Oettinger and Dante Fabbro were named to the pre-season All-Hockey East team. 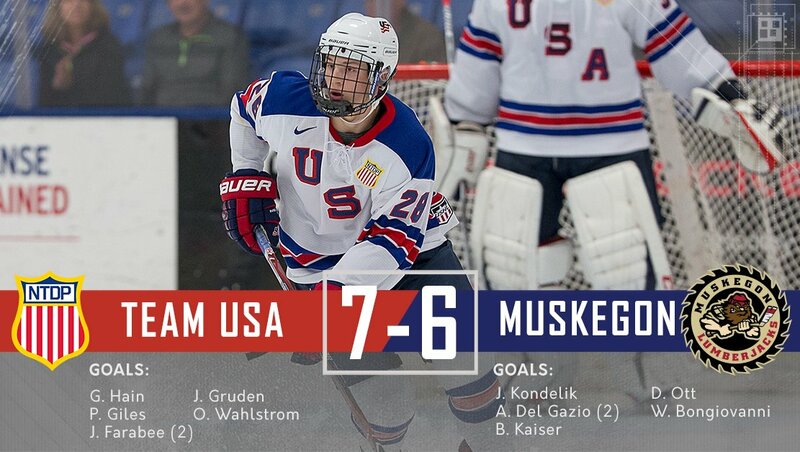 2018 recruit Joel Farabee (photo) scored twice in regulation and produced the only goal in a shootout as the NTDP U18s edged USHL Muskegon, 7-6. The 5’11’ speedster from Cicero, NY tied the game at 2-2 in the second period on a shorthanded breakaway goal. His third-period goal gave the U18s a 6-5 lead, but the Lumberjacks responded late in the period. After a scoreless overtime, Farabee, who had a combined 50 points (25G, 25A) last season between the U17s and U18s, “stole the show, scoring the only goal of the contest on an ever-so-patient move that he followed up with a bar-down wrister on the shootout’s very first shot,” according to the Muskegon recap. 2018 recruit Ryan O’Connell scored his first goal of the season and assisted on the game-winner as BCHL Penticton doubled up Chilliwack, 6-3. The 6’2” defenseman from Gloucester, Ontario has four points in four games for the undefeated Vees. Clayton Keller tallied a pair of assists for the Coyotes, who fell to San Jose, 5-4, in a shootout. ● AZ Central: Can Coyotes winger Clayton Keller be the next rookie sensation? Terriers dropped a 2-1 decision to Merrimack in the regular-season opening game at Walter Brown Arena. BU took a 1-0 lead midway through the first period on a power play goal by Reagan Rust, assisted by Victoria Bach and Abby Cook. 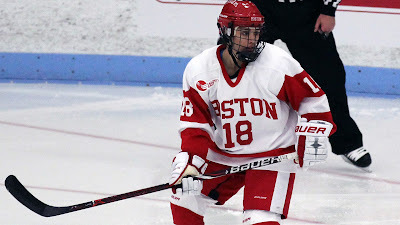 Rust, a junior, transferred to BU from R.I.T. The Warriors tied the score with their own power play goal half-way through the second period and scored the go-ahead goal in the final minute of the period. BU fired 11 shots in the third period but couldn’t produce an equalizer. Senior goalie Erin O’Neil stopped 30 Merrimack shots.